Nucleic acids are a family of macromolecules that includes deoxyribonucleic acid ( DNA ) and multiple forms of ribonucleic acid ( RNA ). DNA, in humans and most organisms, is the genetic material and represents a collection of instructions (genes) for making the organism. This collection of instructions is called the genome of the organism. The primary classes of RNA molecules either provide information that is used to convert the genetic information in DNA into functional proteins, or are important players in the translational process , in which the actual process of protein synthesis (on ribosomes ) occurs. 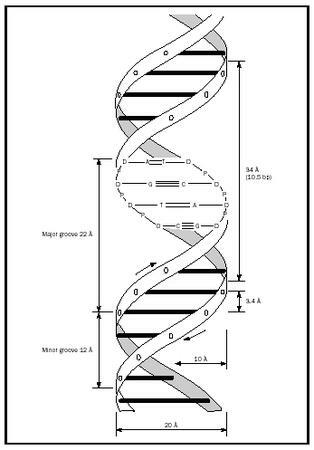 DNA is a right-handed, double-stranded helix, in which the bases essentially occupy the interior of the helix, whereas the phosphodi ester backbone (sugar-phosphate backbone) more or less comprises the exterior. The bases on the individual strands form intermolecular hydrogen bonds with each other (the complementary Watson–Crick base pairs). 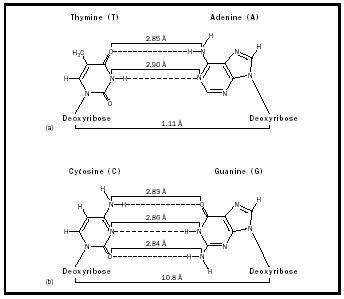 An adenine base on one strand interacts specifically with a thymine base on the other, forming two hydrogen bonds and an A–T base pair; while a G–C base pair contains three hydrogen bonds. These interactions possess a specificity that is pivotal to both DNA replication and transcription (see Figure 2). In complex multicellular organisms (such as humans), DNA carries within itself the instructions for the synthesis and assembly of virtually all the components of the cell and (therefore) for the structure and function of tissues and organs. Within the approximately 3.2 × 10 9 base pairs (3.2 Gbps) in human DNA, the Human Genome Project has determined that there are a minimum of about 25,000 individual segments that correspond to individual genes. The genes collectively make up only about 2 to 3 percent of the total DNA, but encode the detailed genetic instructions for the synthesis of proteins. Proteins are the "workhorses" of the cell, and in one way or another are responsible for the functions that permit a cell to communicate with other cells and that define the character of the individual cell. A kidney cell is very different from a heart or eye cell. Although every cell contains the same DNA, different subsets of the 25,000 genes are expressed in the different organs or tissues. The expressed genes determine the type of cell that is produced and a cell's ultimate function in a multicellular organism. SEE ALSO Deoxyribonucleic acid ; Double Helix ; Watson, Francis Dewey . Kimball, John W. (1994). Biology, 6th edition. Dubuque, IA: Wm. C. Brown Publishers. Also available from http://users.rcn.com/jkimball.ma.ultranet/BiologyPages/ .